Synopsis: Where do you go when nowhere is safe? I’m still fairly new to the dystopian genre, and I’ll admit it still terrifies me. I’ve always had a huge fear of the apocalypse, but I’m also learning that I have a fascination with post-apocalyptic books. 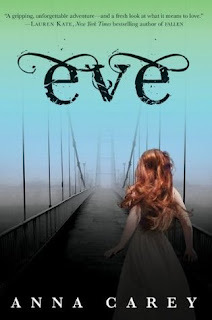 I loved the concept for Eve - a plague wiped out a great deal of the population of earth, and orphans were sent to special schools before going off to learn a trade, or so they thought. But rather than actually going into the real world to follow their dreams, they would be used as ‘sows’ to produce children and repopulate the earth. What a sick - but all-too-believable - concept. Eve’s perfect little bubble of a world is burst and she escapes before she’s sent to spend the rest of her life producing babies. She meets some interesting characters along the way, makes new friends, and learns a lot about herself and what the world is really like post-plague. Her journey isn’t only a physical one, but an emotional and mental one as well. It was all so real and believable in a very frightening way. I constantly found myself wondering what I would do in Eve’s place, or how I would handle certain situations. There were parts that were absolutely heartbreaking, which I’m quickly learning is a common theme in dystopian books. There was a nice mixture of action and suspense, and enough plot twists and turns to keep me interested the entire time. The ending had me cursing because I want to know what happens and I hate that I have to wait until July…July?! 6 months?! Seriously?! Ugh. This book counts toward the following 2012 challenges: January 2012 Harper Imprint Challenge, 2012 Young Adult Reading Challenge, 2012 Support Your Local Library Challenge, 2012 New Authors Reading Challenge. See my progress in these and other challenges here. Oh I love the sounds of this especially that it's believable. I have seen mixed views on it but I'm still way too intrigued. Great review! I enjoyed seeing Eve's character growth over the course of the novel and I am SO dying to know what happens next. I was a little nonplussed over the book but it did hold my interest and make me want to read the sequel! The story is very fast- paced and I felt like the story was done before I actually grasped it all. I was also disappointed in the ending, it was not what I expected. Though, it does leave you wanting for more. In conclusion, I have enjoyed Eve, but I think that it needs more work. I recommend it to anyone looking for a good and different kind of story. It is filled with adventure, though it moves fast- paced.